• 100 x 3.5 x 15mm, 100 x 3.5 x 20mm, 100 x 3.5 x 25mm, 50 x 3.5 x 30mm, 50 x 3.5 x 40mm, 100 x 4 x 20mm, 100 x 4 x 25mm, 100 x 4 x 30mm, 150 x 4 x 40mm, 100 x 4 x 50mm, 100 x 4 x 60mm, 100 x 4 x 70mm, 50 x 5 x 40mm, 50 x 5 x 50mm, 50 x 5 x 60mm, 50 x 5 x 70mm, 50 x 5 x 80mm, 50 x 5 x 90mm, 50 x 5 x 100mm. Complete with 5 Pozi bits. Single Thread Countersunk Pozi Screw Pack (1500 Piece) is rated 4.8 out of 5 by 8. 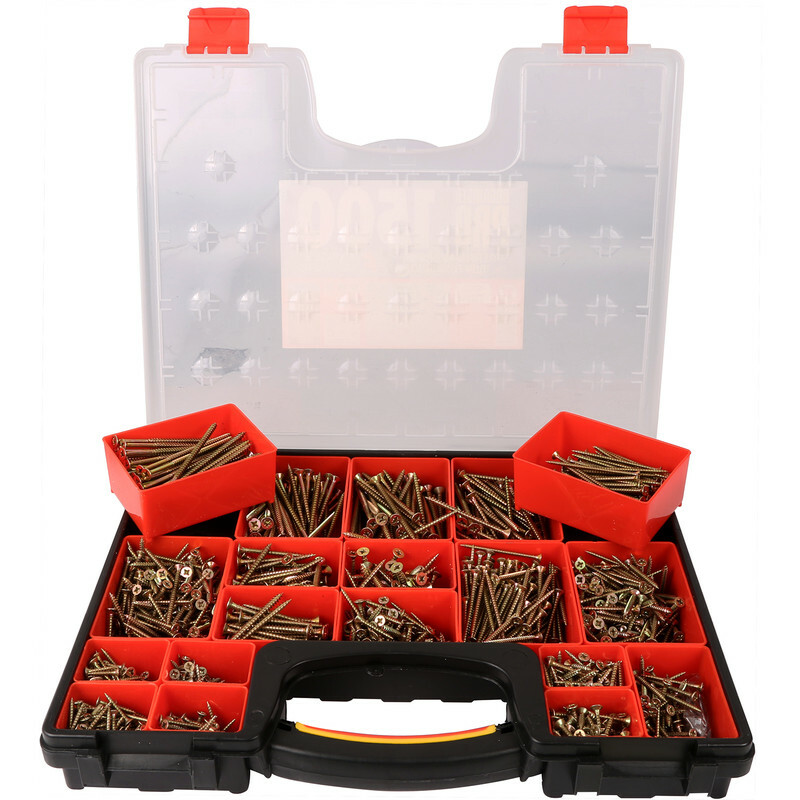 Rated 5 out of 5 by Foggy007 from Good mix of common use screws Large box of the most commonly used and useful screws. Easy to find a size chart on the lid which will come in useful when I need to top up on the most used screws. Rated 4 out of 5 by Chunky1970 from Great assortment at a reasonable price I have just started to use some of the screws. Nice section in size & length. The only issue I have is some of the screws were miss shaped, more like a nail than a screw. Rated 5 out of 5 by Dave 35 from Never short of a screw Wide selection of screws and good price. Rated 5 out of 5 by lukid1 from better than expected have used a few screws does the job very good value for money.